Ahh, the early days! The sweet, creative, optimism of America's rebellious beginnings based on the principles of freedom, liberty and justice for all. That is what comes to mind when browsing Thomaston Place Auction Galleries; upcoming 2-Day, Winter Feature Auction on February 11th and 12th. The distinctive spirit which rests in the patina of American antiques is that of innocence, nostalgia and revolution. One has to wonder if these early artisans were self-aware of their monumental significance in history or if they were simply noodling around, enjoying the tides of their times. Both catalogs feature important American Furniture, Decorative Arts, Fine Art and Folk Art, amongst other genres and specialty items. Weve selected some exciting pieces that ought to get your imaginations whirling back to a time when Americas explorations also included the search for a creative identity - lets hop to it! 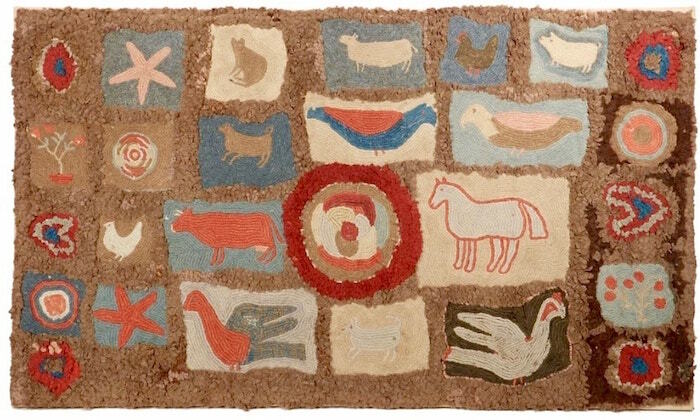 If there were wars breaking out all over the world, particularly on American soil (..cough,cough..the American Civil War..) while this amusing rug was being looped through its backing, the artist certainly didnt feel like being reminded of it. A wonderful, floating display of starfish, farm animals, rose bushes and bullseyes all exist on their own rectangular plot of yarn-land. The creatures; chickens, frogs, sheep, horses, cats and dogs turn left, right and center like a pictorial alphabet or personified punctuation signs. Although, the varying shapes and sizes might seem random at first, one will find that the free flowing placements make for a relaxing, fun and well balanced composition. 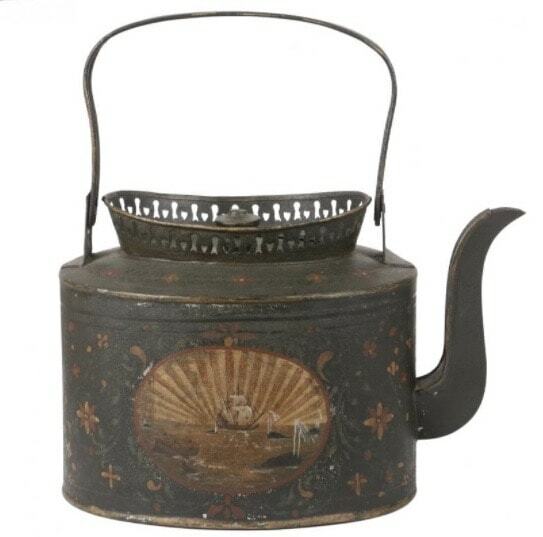 We sure hope that when the water boiled in the belly of this early American teapot, that the steam screamed out of the spout much like the blowholes of the whales depicted on either side of this, sailor painted, kitchen accessory. An agreeable floral design blooms around oval windows which open up to whaling scenes, complete with Japanese inspired sunrays. It is possible that this sailor may well have visited Japan on a oceanic hunt, adding a heightened, personal nostalgia to this pleasant domestic object. If you're in the market for a chair that will significantly improve your posture, look no further; this Seventheenth-Century, Massachusetts Pilgrim Armchair embodies the early immigrant designs which were joined at right-angles with sturdy, low-horizontal proportions. 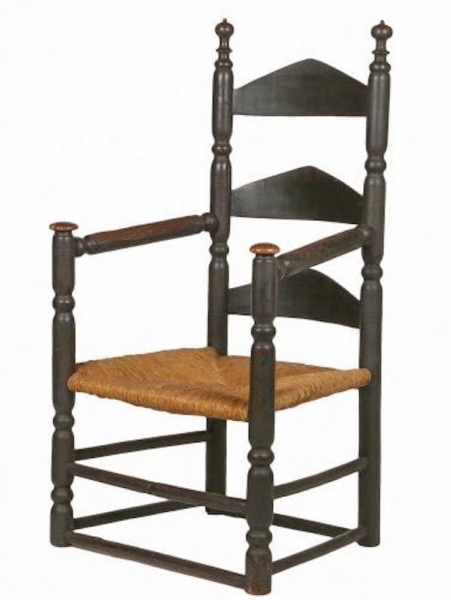 The final top rings adorning the back with sausage turned stiles, three arched horizontal slats, bun top armrests, a quartered rush seat and a black finish over Maple wood, makes this an antique to be desired. This epic example of American folk art combines a charming primitive style with grandiose subject matter, placing it at the tippy top of our American history flagpole. The earth-toned scene, titled Memorial to Washington by Cynthia Bushnell Wilcox is framed by a radiant, period lemon-gold frame which struck us like a charged cannon. 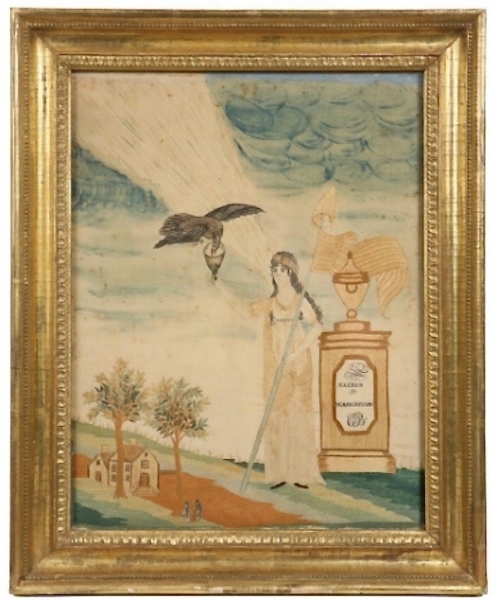 Painted and stitched onto silk as a record of remembrance, Wilcox places a giant Lady Liberty in the middle of a country dirt road, appearing like an apparition of a Roman goddess. She stands with a flag in one hand while extending a chalice in the other. A curling blue and white sky is divided by a beam of air, streaming behind the symbolic eagle who is hovering down and drinking from the offered libation. The glorious visitation from Lady Liberty who is joined by a trophy shaped monument, reading "Sacred - Washington," is staged next to a humble home with two trees and a tiny husband and wife walking along a path. Further more, to highlight its paramountcy, a label from the Museum of American Folk Art NYC, citing the "Liberties with Liberty," exhibition (Feb. 1986 - Sept. 1987) adorns the reverse of this marvelous memorial. 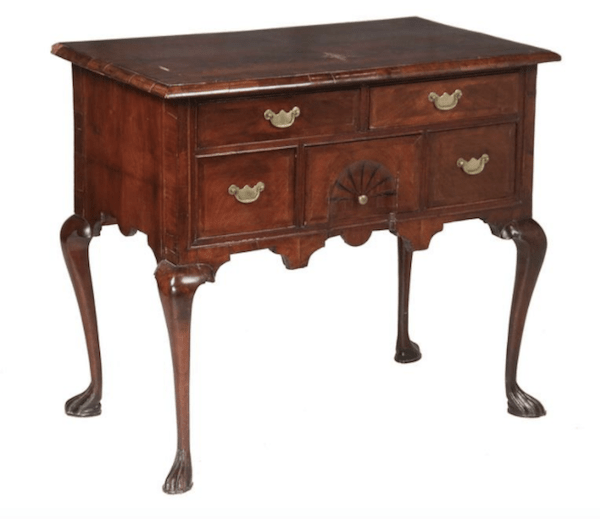 Amongst an impressive catalog of lowboy and highboy pieces, this relatively simple yet important item caught our attention for its delicate silhouette and curious feet. The exact animal that these small, elegant paws belong is unclear, however their naturalistic style is easily enjoyed and resembles the European, Neoclassical aesthics that inspired the Queen Anne style. The title lowboy serves a literal purpose, as it was usually used as a vanity or dressing-table where a gentleman or lady could sit in front of a mirror to spray themselves with delicate perfumes or pin their hats with the latest fashions. Speaking of vanity and fashion, we can't think of a better conclusion to this Americana round-up, than coming face to face with the grand-daughter of Colonel Timothy Mann, an original Minuteman and Revolutionary War hero. 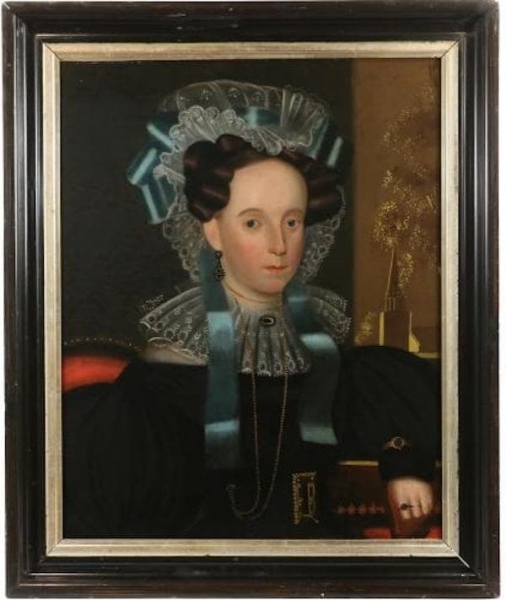 This wonderfully detailed portrait is dominated by a shining blue ribbon which crowns, the weathly womans curled hair and laced bonnet; adding a pop of color to an otherwise serious palette. The artist depicts his subject so solidly that it conjures a frozen in time feeling, as if the year 1830 has been encapsulated into the pigment and fibers of a smooth, rectangular canvas. To view the full sale catalogs click here for: Winter Feature Auction Day-1 (02/11) / Winter Feature Auction Day-2 (02/12).